Quirky Jessi: For All You Gamers Out There--W00t!! For All You Gamers Out There--W00t!! Runner-up was "facebook" as a new verb meaning to add someone to a list of friends on the Web site Facebook.com or to search for people on the social networking site. "People look for self-evident numeral-letter substitutions: 0 for O; 3 for E; 7 for T; and 4 for A," he said. "This is simply a different and more efficient way of representing the alphabetical character." "w00t belongs to gamers the world over. 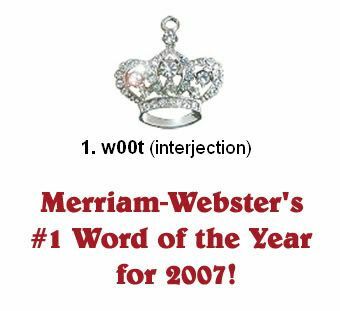 It seems to have been derived from the obsolete 'whoot' which essentially is another way to say 'hoot' which itself is a shout or derisive laugh," Think Geek said on its Web site. Online gamers often replace numbers and symbols with letters to form what Merriam-Webster calls an "esoteric computer hacker language" known as "l33t speak." This translates into "leet," which is short for "elite." Other runner-ups included surge, hybrid, and Bluetooth. Check out the rest of the article here.